Photo courtesy of the Homegrown National Park Project. Canada’s newest “national park” is a vibrant patchwork of green space meandering through dynamic downtown neighborhoods in one of Canada’s densest metropolises, along the former path of a creek buried more than 100 years. It’s a welcoming space for birds and bees that’s nurturing a new generation of city-builders. And it may spread to your city. Authors Douglas Tallamy and Richard Louv originally proposed the ‘Homegrown National Park’ idea. They advocated stitching together a diverse tapestry of green spaces to create a living corridor for butterflies, birds and bees. Ultimately, this connected pollinator pathway would become a natural space to rival traditional national parks. The David Suzuki Foundation launched the Toronto Homegrown National Park Project in 2013, starting with the former path of Garrison Creek in the downtown west end. Two-dozen local residents were recruited as Homegrown Park Rangers, trained in community organizing and connected with local environmental and city-building organizations. Then they returned to their home turfs with a simple mission: to make awesome things happen where they live, work and play, with the ultimate goal of co-creating a green corridor through the heart of the city. 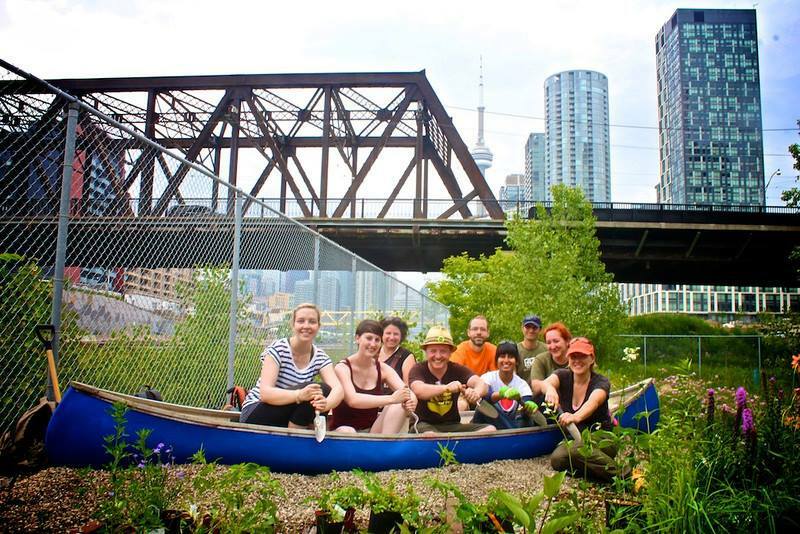 These newly minted community leaders connected with local groups and agencies, participated in community events, made new partnerships and created opportunities for plantings in parks, yards, schools and laneways. Over the past two years, the Park Rangers have added thousands of wildflowers and native plants, often in surprising nooks and crannies and in unexpected ways — a network of flower-filled canoes in schoolyards and parks, and patches of pavement transformed into butterfly gardens. Together, through more than 30 initiatives, they’ve begun to bring more nature to the city and create the foundation for even more striking transformations. The project has cultivated a reputation for bringing residents out to celebrate the wonder of nature nearby, with fun events combining art, music, food and drink with the project’s ambitious ecological goals. What’s most exciting is the potential for communities across the country to adopt this place-based activism. Cities are facing increasing challenges, from rapidly growing populations and aging infrastructure to economic downturns and uncertainty. They also represent remarkable landscapes of opportunity for green interventions — from rooftops and schoolyards to trails and laneways. Vancouver’s ‘Country Laneway’ project and Montreal’s ‘Green Laneways’ demonstrate the rich transformative possibilities lying dormant in the hundreds of residential and commercial laneways found in most cities. Colossal crisscrossing hydro and railway corridors can be reimagined as recreational and naturalized spaces, such as Toronto’s proposed Green Line and ambitious 80-kilometre Pan Am Path. Projects like the U.K.-based ‘River of Flowers’ and Seattle’s ‘Pollinator Pathway’ have shown the power of making space for birds and bees in a city. You need look no further than a Google Map to see vast seas of rooftops awaiting urban greening. While green-roof technology is just beginning in Canada, innovative companies like Montreal’s Lufa Farms are demonstrating that roofs can not only be greened, but can also provide healthy, local food. A key strategy in connecting green spaces is utilizing the areas in between. Neglected bits of streetscape and “meanwhile” spaces sitting empty, waiting for the next highrise or commercial development, can become temporary pollinator patches, community gardens providing local food, or space for quiet sanctuary, movie screenings and community dinners. They bring neighbors together. In short, they make communities more livable. Will Canada’s network of Homegrown National Parks ever rival our actual national parks? Not likely. But we must harness and amplify this homegrown local creativity to enhance urban ecologies and make our communities more livable and resilient. Smart urban innovations should be scaled up, shared and continuously adapted, supported by smart public policy and investment. Here’s to the many local organizers, innovators and park rangers who are making our cities greener. Please keep bringing nature home, one fun, green intervention at a time! From our friends at the David Suzuki Foundation. Written by David Suzuki with contributions from David Suzuki Foundations Communications Specialist Jode Roberts.